Yenagoa — The Joint Task Force in the Niger Delta otherwise known as Operation Restore Hope has warned militants against any planned attack on the nation oil and gas installations saying it would deal decisively with any of them caught violating the amnesty agreement. A group which calls itself "Coalition of Niger Delta Freedom Fighters" had last week threatened to cripple the oil industry in Delta State and the Niger Delta in general," over what it called "The Imposition of Governor Uduaghan on the people of Delta State." Condemning the violent posture of the group to an issue which could be resolve at the election tribunal the Joint Task Force urged the group to have a rethink in their own interest as the days of tampering with national infrastructure over perceived injustice or grievances was over. The JTF in a statement issued in Yenagoa by its media coordinator, Lt. Col Timothy Antigha warned that no group has the right to take the law into its hands or resort to self help because his/her preferred candidate did not win the Delta State gubernatorial election or any other election for that matter. It urged all aggrieved parties to approach the election tribunal with evidence of alleged malpractices for adjudication instead of engaging the services of discredited individuals to threaten the peace of the state. The statement read in part, "The attention of The Joint Task Force (OPERATION RESTORE HOPE) has been drawn to a threat issued by a group which calls itself "Coalition of Niger Delta Freedom Fighters", to "cripple the Oil Industry in Delta State and the Niger Delta Region in general", over what it called "The Imposition of Governor Uduaghan on the people of Delta State". "The threat from this previously unknown group was published on page 10 of Vanguard Newspaper of 6 May 2011. The JTF condemns this threat in very strong terms and earnestly implores those behind it to ponder deeply before embarking on what may become a regrettable course of action. "Moreover, The JTF notes that no individual or group has the right to take the law into its hands or resort to self-help because his/her preferred candidate did not win the Delta State gubernatorial election or any other election for that matter. "The Government has constituted Election Tribunals to handle all election related petitions. Therefore, the JTF advises all aggrieved parties to approach the tribunal with evidence of alleged malpractices for adjudication, instead of engaging the services of discredited individuals to threaten the State. Furthermore the JTF warns that the days of tempering with national infrastructure over perceived injustice or grievances are over. "In this regard, the JTF wishes to state that it is poised to deal swiftly and decisively with anyone or group who attempts to foist another spectre of fear and insecurity on the Niger Delta Region. Similarly, the JTF wishes to advice parents and traditional rulers to restrain their wards and subjects from being used by dis-satisfied politicians to foment trouble." 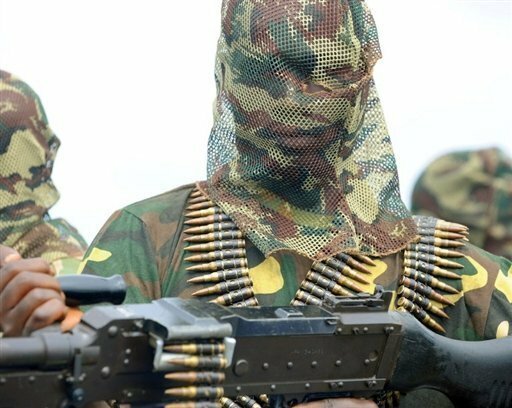 The JTF reminded ex-militants of the subsisting amnesty agreement which forbids them from returning to militancy warning that any ex-militant caught for violating the amnesty agreement will be treated like a criminal and their sponsors be made to face the full weight of the law.